The Intel Core 2 Duo 'Conroe' E6600 processor runs on a 1066 MHz FSB (266 MHz motherboard clock speed) which means it's already faster than what any Pentium D 840 could overclock too from a 800MHz (200MHz) starting point. As usual before the overclocking began, PCSTATS set the Corsair Twin2X2048-6400C4 memory frequency was set to run in DDR2-533 mode, this way the memory will not hold the Gigabyte GA-965P-DS3 motherboard back. The GA-965P-DS3 also supports lowering the CPU multiplier to 6x, so we set the CPU to that so we'd have one less bottleneck. 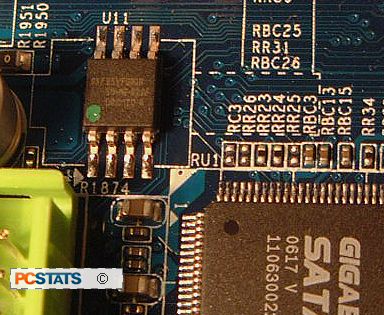 Starting at 266 MHz FSB the Gigabyte GA-965P-DS3's clock speed was increased in small 2-3 MHz intervals. Overclocking with the Intel Core 2 Duo processor is unknown waters for me... and I didn't want to risk damaging a component so things went a little slower at first than I'm normally used to. The Gigabyte GA-965P-DS3 was definitely up to the overclocking challenge, and it handled each increase in clock speed very well. In fact the GA-965P-DS3 motherboard did not give me any problems until the 310 MHz mark. Getting past that speed required the Intel P965 Express chipset voltage to be increased slightly (0.2V). In the end this little overclocking adventure peaked at a maximum speed of 352 MHz. Anything higher and the Gigabyte GA-965P-DS3 would start to experience stability issues when running through the benchmarks. At first glance the Gigabyte GA-965P-DS3 motherboard seems to be lacking a BIOS chip - at least one that conforms to the standard square CMOS Plastic Leaded Chip Carrier (PLCC) package we're all accustomed to. Right next to the lone nuclear green IDE connector is instead a Silicon Storage Technology SST-25VF080B 8Mbit SPI Serial Flash chip (see at right, under the marking 'U11'). This is an 8 lead surface mounted chip of about 3mm square, in a SOIC package. RoHS compliant, the very small BIOS chip occupies hardly any board space, requires a little less voltage to operate, and has 8 Mbit's of storage space... or in other words it will hold 1024 MByte's of data! Looking around inside the GA-965P-DS3's BIOS we soon discovered that Gigabyte has really increased the amount of overclocking options available to the user. It now allows enthusiasts remarkably aggressive settings to choose from... gone are the days of 0.2V max voltages! Yippee! To access the memory timing options, you must first press 'CTRL + F1' at the main menu. In the 'MB Intelligent Tweaker' section you have CPU clock multiplier options as well as the ability adjust the motherboard FSB from 200-500 MHz in 1 MHz increments. The memory multiplier allows you to adjust what speed the DDR2 memory runs at. It should be noted that the Gigabyte GA-965P-DS3 supports 1066 MHz operation as well. In the 'MIT' area you'll also find memory timing adjustments and voltage control. I know it's difficult to see, but DDR2 voltage goes as high as 0.7V above stock. 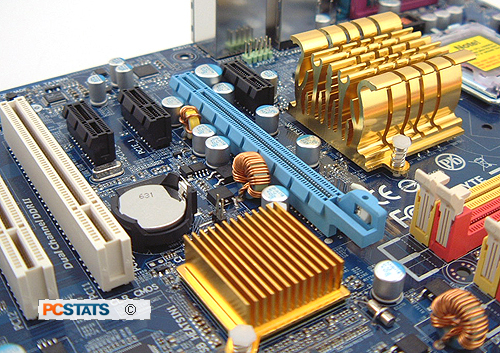 PCI express voltage can be adjusted to 0.1V, FSB 0.3V and MCH 0.3V above stock. CPU voltage goes as high as 2.0V, but definitely use a bit of caution when playing changing that option higher than stock! Up next, benchmarks of this Conroe based Core 2 Duo system!